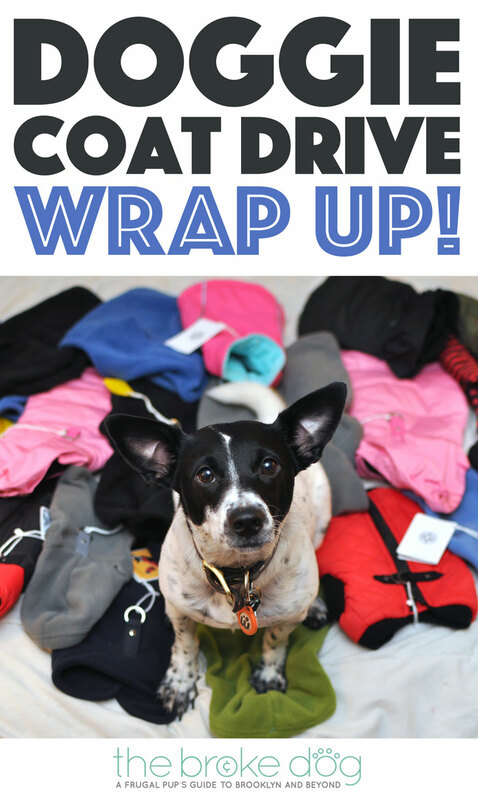 The 2016 Doggie Coat Drive Wrap-Up! This past November, we launched the 2016 Doggie Coat Drive to benefit a couple of our favorite rescues. We were overwhelmed with the incredible response from both brands and individuals. We ended up donating over 200 coats, plus toys, treats, and food. Keep reading for details! The two rescues that I chose to benefit from the Doggie Coat Drive home hundreds of dogs a year. Although this is a tiny number compared to the millions of dogs that enter shelters each year, both rescues take on extreme medical cases that other rescues or shelters might overlook or euthanize. One of the rescues, Badass Brooklyn Animal Rescue, specifically seeks hard-to-adopt dogs from high-kill shelters in the southern United States who either require medical care or have a better chance of being adopted in the North. These dogs, however, have never experienced Northeast winters and lack the ability to deal with the cold temperatures. In 2015, Badass spent over $64,000 on vet bills alone, and over $7000 on dog food and supplies. With so many bills, it’s hard to justify purchasing something like a coat or sweater. That’s where the Doggie Coat Drive Comes in! 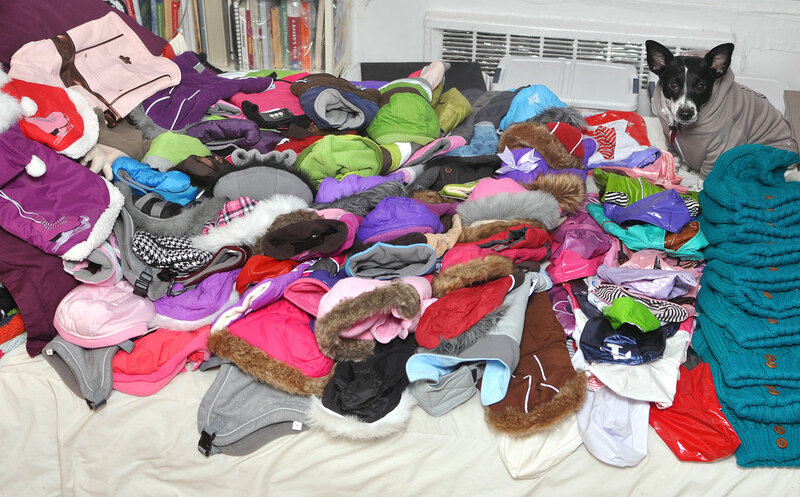 Some of the coats we collected! I chose the other rescue, Sean Casey Animal Rescue, because it’s where I adopted my pup, Henry. They also take on extreme medical cases — such as one dog last winter who was found frozen to the ground in Prospect Park — and raise awareness for Pit Bulls through their Pit Bull Awareness Program and their participation in the New York “Stand Up For Pits” comedy event earlier this year. Pit Bulls and other short-haired breeds often suffer and shiver in the cold, in addition to having a harder time getting adopted. I hoped to keep some of these “pitties” warm, as well as many of the smaller dogs that pass through the Sean Casey Animal Rescue doors. Henry also came from the South, as part of a group of dogs from Arkansas. Sean Casey Animal Rescue treated his heart worm and performed surgery on one of his legs, and this was the least I can do to repay them! I reached out through email and on my social media platforms, asking for physical donations as well as monetary ones. I was absolutely blown away by the incredibly generosity that responded! All in all, we collected 211 physical items and $260 in monetary donations, which was used to buy an additional 6 sweaters, 9 coats, and treats. Teckelklub donated 72 coats, 2 beds, 3 crate mats! FouFou Brands donated 100 coats and sweaters! RC Pets donated 11 coats! Henry snoozing in the donations! A HUGE thanks to everyone who contributed or helped spread the word! Keep an eye out for future fundraising! Yaaaaaaaay! I’m so happy to see such a heart warming post when the world seems so dismal these days. The pups and the rescue organizations will be better able to handle the colder temperatures thanks to you. Great job and thanks to the companies and people who provided donations! Very heartwarming to know that there are people who are still genuinely nice! Brilliant idea to have a coat drive Rochelle. So happy to read how successful it was! The mission of these two organizations is outstanding. Kudos to them for their dedication to these furbabies in need. This is soooo awesome! I would never have thought to do a doggie coat drive. It is a wonderful idea and heartwarming to read about. 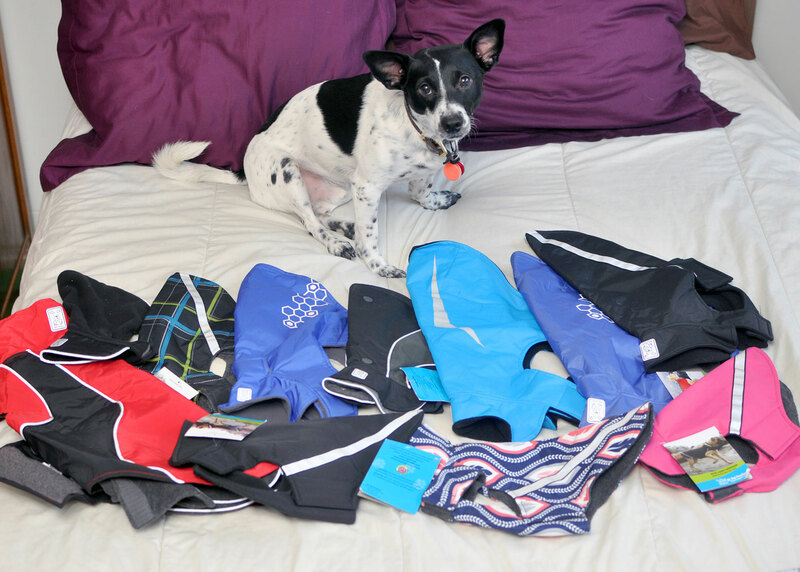 There will be a lot of warm pups due to your efforts. 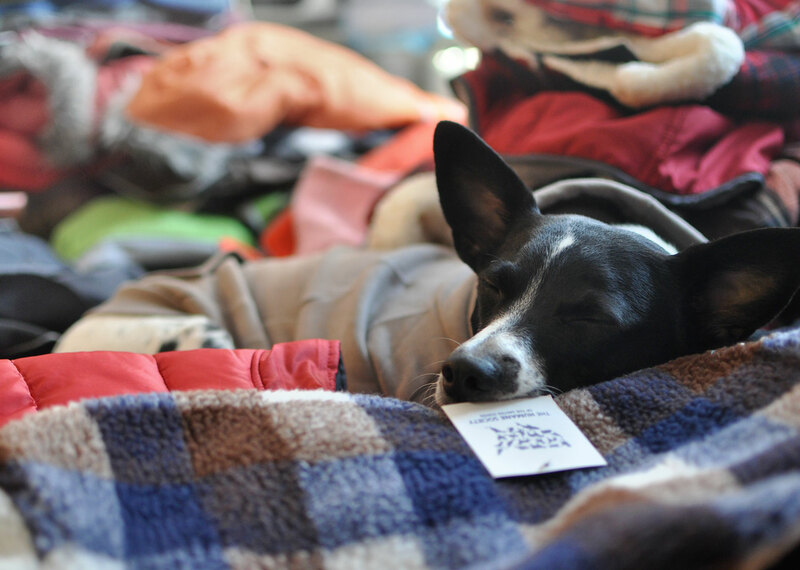 We donate old coats to the rescues here. I just LOVE this idea. I’ve heard of coat drives for people, so why not dogs too. We often donate old blankets to our local shelter. This makes me happy beyond words. Rescue is near and dear to my heart, and to see this really makes my heart sing. I love Sean Casey’s rescue, and I remember that pup in Prospect Park. Kudos to you for this project. Bravo to your fabulous sponsors. Coats are a blessing to a dog in winter when they will be colder than we may realise! Well done with this amazing project!! That’s really impressive! I cleaned Dexter’s closet and toy box and donated to a senior pet hospice. It’s so nice doing other dogs will benefit from Dexter’s left overs. Bless your heart for doing such wonderful and much needed work to help dogs! With all of the bad and sad news, it sure is uplifting to get some positive information. Bless your heart! Wow that is just awesome. Great idea and great that so many companies and individuals were so generous as I am sure it makes a big difference to the rescues. Wow, that is amazing! I am so glad that you were able to organize such a successful coat drive! I am sure the dogs are very grateful for their new clothes. What an excellent idea! This is such a wonderful way to give back to animal rescues! What a wonderful idea! Congratulations on the success. I absolutely LOVE this idea! I’ve collected blankets, towels & food from individuals but never organized a coat drive for pets with coats from stores. How fabulous! It was great seeing you at the DWAA event yesterday! WOW, what an awesome idea! I bet the rescues truly appreciated your efforts, and the dogs too! It warms my heart to know that to many individuals and brands donated to such a wonderful cause. I so wish we had met when I lived in Nyc as I username to do a coatdrive also. A dog coat drive is such a great idea! Especially up north where it gets so cold in the winter. It is very neat that so many coats were able to be collected! This is absolutely amazing!!! It wasn’t until we got River did I realize the importance of a warm coat for pups! This is so cool! Living in Michigan, I can see how handy it would be for dogs to have a coat. It gets really cold up here! It has to be especially hard for larger breed dogs with short hair because you really can’t train them to go potty indoors unless you want a house full of poo. It is really awesome to see how generous people can be! What a meaningful event right there! Thank you for your kindness to organize such impressive coat drive. The dogs will be very happy and cosy with new clothes. Aw, thank you! I had so much fun doing it and the rescues were so happy.